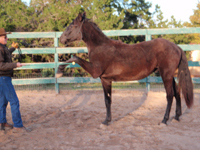 Visten is a Tennessee Walking Horse gelding that was bred in New York state and born into unfortunate conditions. His legs were crooked from malnutrition and he was terrified of humans. 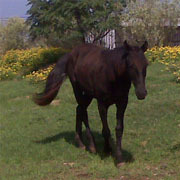 Visten was rescued from his initial situation by a kind women who donated him to FOSH as a yearling. 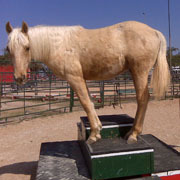 He traveled from New York to Texas in Feb. 2009, where he went under the care and instruction of noted trick trainer Sue DeLaurentis. 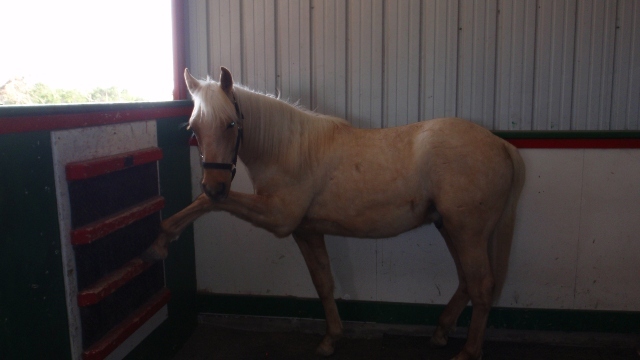 Through the generous donated care of Dr. Glenn Portie, a financial donation from Bill and Deborah Keyes, supplements and cookies from Start To Finish Products and Sue's extrordinary training, Visten has progressed into a healthy, intelligent and willing horse. 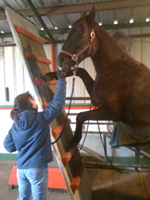 He will remain in training with Sue until his debut performance at the 2010 Sound Horse Conference in Louisville, KY. I can't tell you how Visten has blessed my life. He is very special and very "deep". He has a cute sense of humor and I am happy to say he has not a care in the world. Visten was introduced to the Climbing Wall last week. This is a tall panel with horizontal rungs that is lowered by a motor from the ceiling of the training stall. 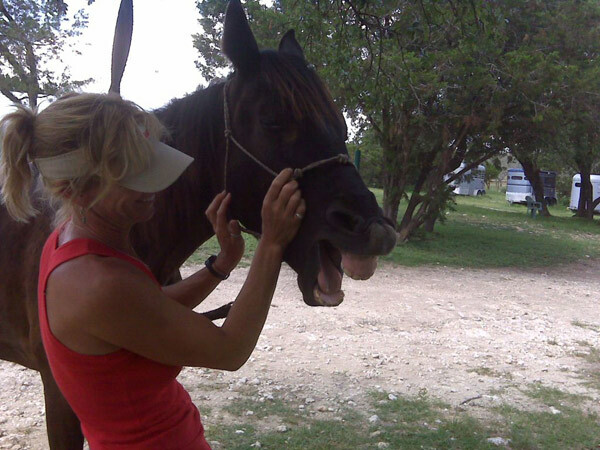 Allen always jokes and says every barn needs one. It took a lot of energy and “inspiration” from me to urge Visten to actually climb it. I was mentally and emotionally exhausted by the time our first session ended. 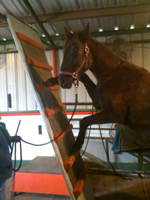 The wall helps a horse to get his weight on the hind end as he reaches out and “climbs” with the front end. With a horse that knows the Spanish Walk, which Visten does, we just position him about 10 feet from the wall and ask him to Spanish Walk toward it. When he takes the last big step before lifting off, we pressure him with a guider and tell him “’Up”. We never force it but strongly encourage him to put the feet on the rungs. When Visten first got his long legs off of the ground and onto the rungs his little (huge actually) knees were shaking like a leaf. His face was so expectant and so proud that we (Kristi and I) laughed out loud. He just got better and better with each repetition. Today we will begin working on getting him to climb higher and reach with his front legs. Just imagine how much courage it takes for a colt like Visten to climb when he is asked!! I think that there is nothing that he won’t try for us with enough encouragement. And I stress encouragement as this is what training is really about. If he will climb a wall, I think he will try anything for his humans if given the time and space that it requires of him! Visten’s coordination continues to improve. I hardly have to duck now for fear that he will “bob” and hit me with his head. I haven’t gotten tangled in his long legs for a few months now. There’s still a ways to go before his coordination is what we would call normal, but it’s much better. I recently built a new small open barn for Visten and Boullet and it borders the boarding side of the ranch. The boys can watch folks come and go all day and work with their horses. This makes it easier for me to catch one of the boys and work him for a few minutes several times between my other chores. Visten can stand the goings on just so long before he starts pulling at the halter and lead that are fastened on the gate. 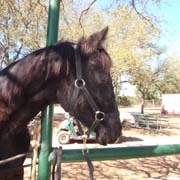 He pulls and tugs and tries every way to put his head into the halter as if to make sure that I know it is his turn. I had someone ask the other day how in the world we catch our horses if they aren’t in stalls? Ha, you have to almost run from these boys! Visten loves to “walk out” either by being ponied or led from the golf cart. And talk about a running walk!! We are back to working on the Kneel, separating it out as a single move rather than part of the Lay Down process. He is doing great, very quiet and cooperative and not the least intimidated in any way. Will get a video clip soon for you than shows his super Spanish Walk!! Talk about big steps! He reaches so high that he has to swing his head so as not to hit his chin with his legs. Note from a Visten supporter: That is so awesome, Sue! Thank you for your patience with Visten and taking him out on the trails like a big boy. I am happy that he can do a running walk after those issues with his legs and early crookedness. This brings tears to my eyes. I can see why you find him so endearing. Visten is doing just great with learning to kneel. Here he is on the second day, kneeling in exchange for a "cookie". As you can see, it is no big deal to him and he is very sweet and compliant about it. No struggle, no problem. We will start on the rest of the lay down in a few days. 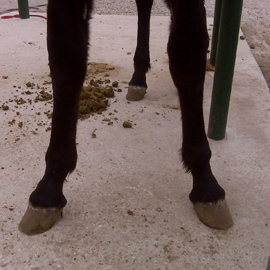 Note the very deep shavings (lay down stall) and the knee padding. 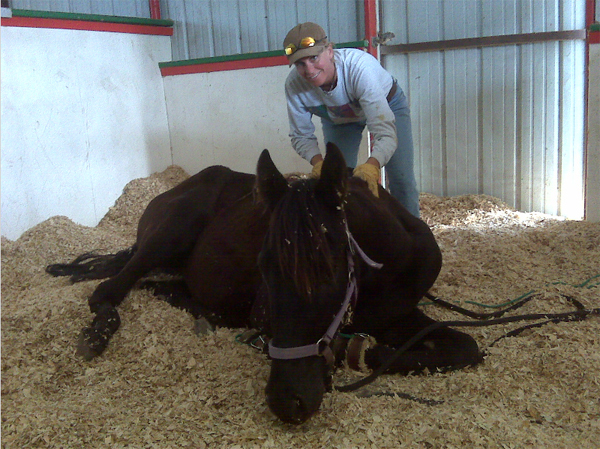 Boullet lays down on cue now both outside and inside the “lay down” stall inside the barn. He has been completely willing and sweet about the process. Next he will learn to “sit up” in the deep shavings (about 2 feet). I let Visten watch from outside the stall and he is curious and calm. Yesterday I started hobble training Visten. 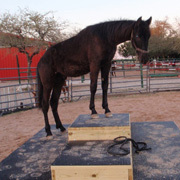 This is the introductory training that is done prior to a horse learning both the lay down and the kneel. I was very interested to see how he would react. We approach moves of this sort that we call “moves or tricks of submission” as a process and not a move in themselves. Each horse comes to this series of moves with his own baggage, resistance or lack thereof. To treat the teaching of moves of submission with other than a humble and empathetic attitude does the horse a great disservice. Visten could have easily been scared or resistant considering his plight early in his young life. He was not… he was trusting and patient and compliant. He has been wearing a light pad and surcingle for some time although not in every training session. He is also accustomed to having his legs wrapped and with wearing hobbles around his pasterns. 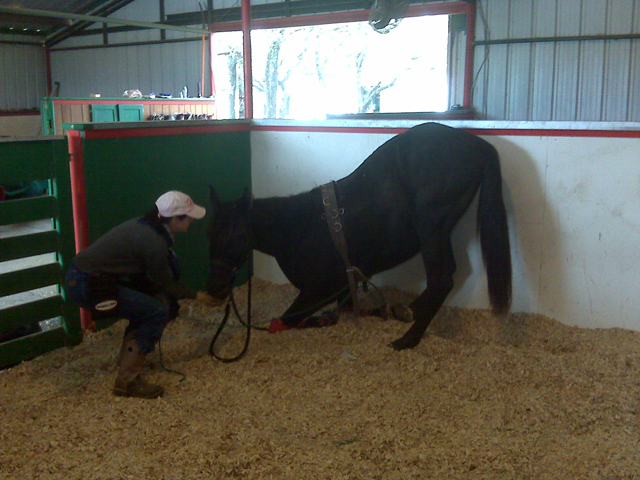 I took him into the lay down stall and asked him to pick up his near leg which he did without hesitation. I did this a number of times so that he understood that I would let him put his leg down in a reasonable length of time. After a few repetitions of lifting and holding his leg with the rigging I asked him to take a couple of steps in that position. He did so confidently and with no struggle. He did look at me in a curious way but was completely confident in me and the process. I did not have company so the pictures that I snapped were not great quality. I believe that learning to lay down* on cue will be non eventful for both me and for Visten. *We commonly use the term lay down although lie down is grammatically correct. 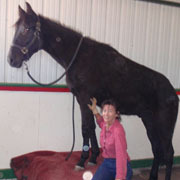 Tracy Green, our local Equine Touch practitioner has donated some sessions out of her busy schedule to work on Visten. 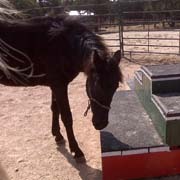 Since Visten arrived he crossed over with his hind legs. What I mean by that is that the hind feet cross over the center line (vertical) of his body or in other means a line parallel with his spine. It was most interesting to observe. Three days after the first session with Tracy, Visten‘s back feet were straight on the center line but did not cross over. Last week after Tracy’s second session with him, there was a separation of just a few inches in his foot fall. The progress is great. Visten thoroughly enjoyed his second session which was great to see because he was a little withdrawn during the first one. In fact, by the time she started to work on his head he looked as though his knees would buckle and he would just collapse. He yawned and stretched and just totally relaxed. Another change in his physical condition was that after the session last week he began to stop and back when cued at liberty without turning his head around backwards! This was terrific progress. Visten is very happy, and he is growing a lot. His ugly duckling look is beginning to change also. Visten is SO hot with the remainder of his fuzzy black hair. It went from 70s to mid 90s with lots of humidity and he is really suffering. Working on free lungeing in the round pen and it seems like it is a little easier for him to move out (structured, not zooming) than it was. We are still working on liberty work in the schooling stall. He is a little better about not losing his balance and plowing over me. Some days his balance is better than others. He is also really good at “walking with” me. 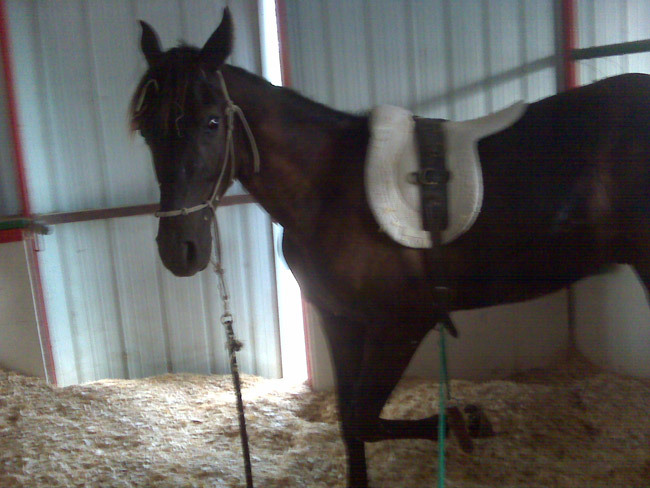 Started asking him to pivot his hind end around the front feet (on ped) or in other words, yielding the hind quarters. Yesterday I put a blanket and surcingle on him and he didn’t even notice. He wore it for the entire schooling session, no big deal. EVERY single night when I go to call him in after it is dark, he always comes to me. I didn’t teach him this, he just did it from the very first (ok maybe second) day that he arrived. Sometimes if it is pitch black he will walk up behind me and push me with his nose as if to say “looking for me?”.I believe he thinks it is funny. He turns and walks along side of me all the way back to the corral, no matter how far out he is grazing. Visten and Boullet had a session together today in the training stall. They both walked -- ok dashed at first -- around the stall and finally settled in to a walk. Boullet knows how to do figure eights using the pedestals as the two parts of the "8". This means he changes directions as he crosses through between the two pedestals if I cue him. If I tell him to "walk on" then he does that instead and continues on the perimeter of the stall. 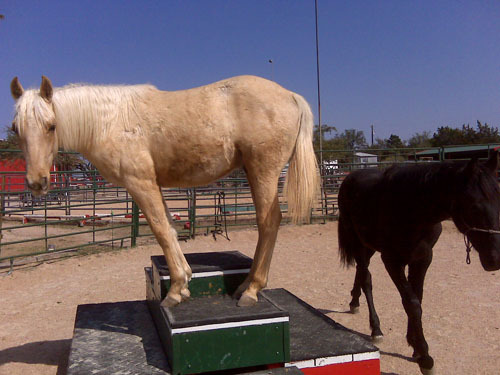 By the end of the session, each colt could be signaled to mount either a separate pedestal or the same one. They also took turns standing their ground or pedestal as the other walked the perimeter. Boullet can walk his figure eight pattern while Visten stays secure on his place or pedestal. Today Visten and Boullet “played” on the new agility platform that Allen built and it was like the light bulb came on for Visten. Last time we schooled with the pedestal, it was still difficult for him to step up with his front feet without lurching around. 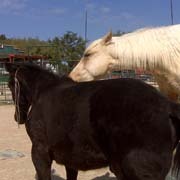 Boullet and Visten worked at a walk (liberty) in the round pen, nose to tail, no zooming. I stopped Boullet at the pedestal and asked him to step up which he promptly did as Visten watched. I put a lead on Visten the first time that he climbed up with his buddy but after that I just pointed his nose toward it and asked him to step up which he willingly did. A little later in the session I put Boullet out and played with Visten and he was very pleased to mount the platform each time I asked him. His coordination and confidence are growing every day. His coat is still scruffy but I think he will look different when he sheds out the baby fuzz. He can walk now without wincing which shows that he is gaining strength. I think he is liking his life. Visten and Boullet had the day off today. It is really cold (for here!) at 42 degrees and raining. The boys did jump in the trailer to eat their Junior Feed and today is the very first day since Visten has been her (one month tomorrow) that he has walked without wincing and getting off balance on the small rocks in the driveway! Yeah!!! His feet are finally hardening up a bit. There has been no swelling in his legs for 5 or 6 days and today his eyes looked the best ever. Wonder if he is sensitive to pollen and with the rain there wasn't any?? I went out last night after dark and he came up to me as usual but put his big head in my arms for some good scratching. He is going to be a real lover. Visten is doing great. Visten has the habit of just walking over the handler or a horse if it is on his left side. I think his lack of socialization when a baby probably perpetuated this. 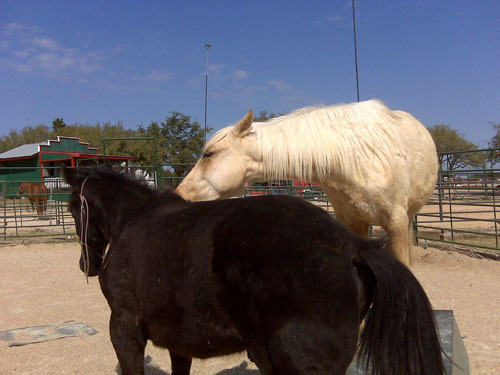 Usually the dam and other horses in the herd help a foal understand the concept of personal space but he had no playmates until he came to Red Horse Ranch. Combined with his lack of coordination, the space issue is magnified. Running into whatever gets in his way on his left side may be habitual as his left knee cuts a wide swath when he walks. When leading him, one has to be careful that he doesn't hit you with his (left) knee or misjudge his step and step right on your foot. He doesn't have accurate aim with his front feet. He also hides his left eye from view by swinging his head and neck to the right. This will take some work but we will get there. I am certain that pedestal work will help him to aim more accurately and have enough confidence to actually look where he is going instead of rushing wildly. He really likes standing up so tall and today he stepped his front feet up twice without me having to bend down and pick up each foot. He watched Boullet do some pedestal work and use the kick board again. As Boullet approached the kick board I put a little pressure on him from behind with a guider and he just climbed right up the wall and stayed there for his cookie. This is the short climbing wall. 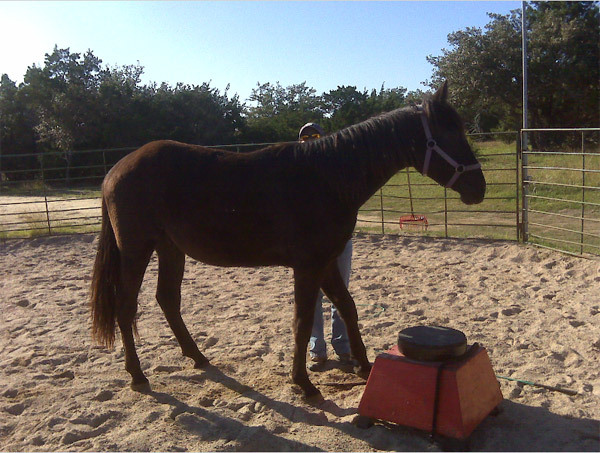 It really works the hind end, the back, the shoulders as well as the horse's balance and confidence. 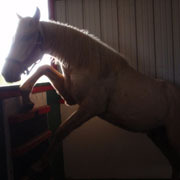 If a horse will go up the climbing wall when asked, think how much confidence he will have later in life on the trail. Visten is certainly not ready for the wall but it is good for him to watch! Today Visten watched Boullet work on the kick board. I tied Visten in the schooling stall across the gate so that he could watch Boullet. Boullet is working at liberty in the stall, allowing me to send him in the direction I desire and then either step up on the pedestal or go to the kick board and hang a leg on it. The kick board is like a barre in a ballet studio, it is for balance. 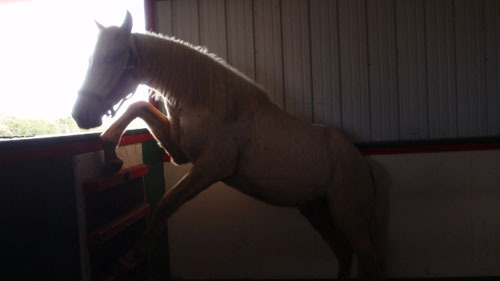 The horses learn to lift either the left leg (verbal cue “one”) or the right (“two”) as directed and reach out to put the foot on the rungs. This is a great exercise for any horse but especially gaited horses as it really helps to create strength and range of motion in the shoulder. This is helpful to create a big step or Spanish Walk. It is also a form of the Jambette (the leg extension or salute). 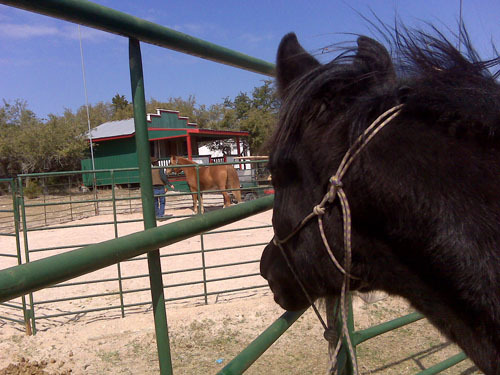 Horses learning by watching other horses, is something that we all see foals do by imitating their dams. Dr. Robert Miller has devoted discussion of this in some of his books and it is called Allelomimetic Behavior or “Copy Cat” behavior. It really accelerates the learning process. 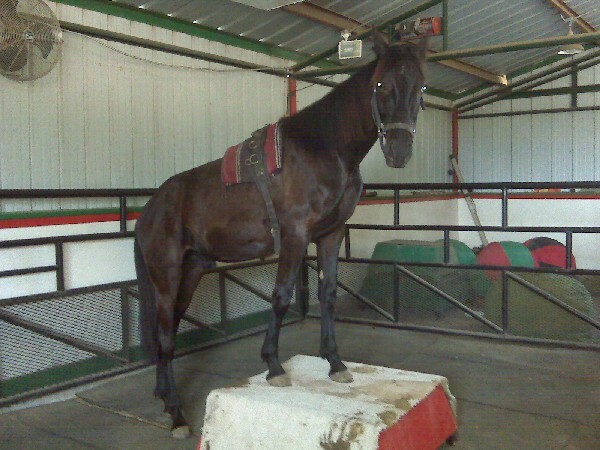 After Visten had watched Boullet for some time I switched the colts and worked with Visten on stepping up on the pedestal. This is somewhat difficult for him as it seems that his feet don’t land exactly where he thinks that they will land. After a couple of tries though he gained some confidence and really enjoyed the view and the feeling of being so tall. 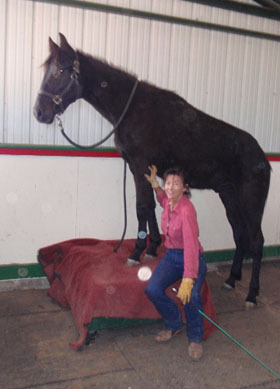 Virtually all horses seem to like being a foot or more taller and it is very easy to see that they see the world from a different perspective. Pedestal work really helps to build confidence. Dr. Portie called today and said that Dr. Dutton said to get Visten back in school and also to let him play. He thinks that Visten is not necessarily in pain at this time and says we will face that if it manifests. I was expecting a hopeless outlook so was very pleasantly surprised. I was happy to get back to the ranch to let Visten out to play with Boullet and assure him that school will start again tomorrow. We hope that the exercise and schooling will work to help him gain strength, coordination and confidence. I will proceed with his training and see how it develops.what his strengths are and areas that he may struggle with. I know that where he intends for his front legs to go is not necessarily the place that they go. I am not certain how his brain compensates (or doesn't) for his very crooked front legs. 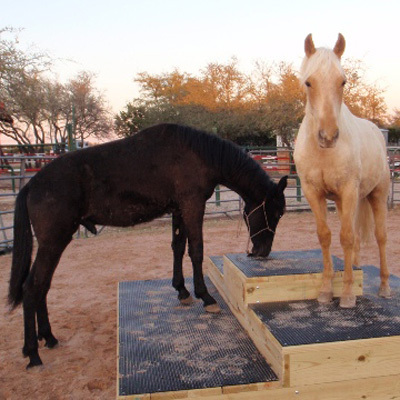 He looks intently at the square top pedestal and makes a great try to step up but often misses the 3 foot top entirely and then seems a little disoriented. I think I will email Dr. Deb Bennett on this and get her opinion. So for now, it is sunshine, friendship and school for Visten. Thanks for all of your positive thoughts and prayers! 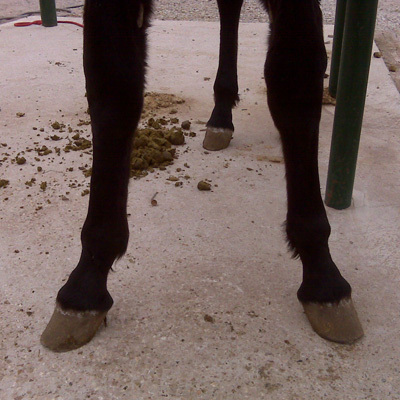 Visten's legs have no swelling today except for the regular problem areas. 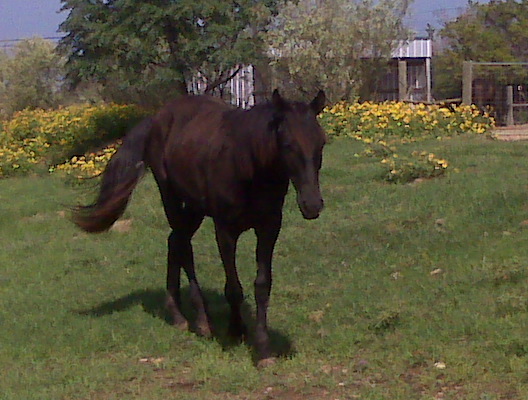 He is somewhat depressed at the loss of his freedom so I put the colts up in the corral and turned Visten out to walk around. First thing he did was to go and hop in the trailer and stick his head out the window and whinny at me and I am sure he was saying "I'm in now where's the food?" which made me laugh. What could I do but feed him? After he ate, he backed out all by himself which was a first. He then wandered down to the mare pen to flirt over the fence. 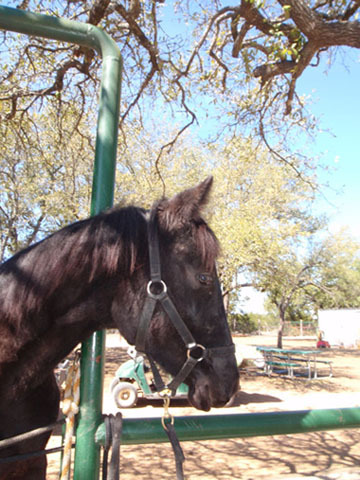 There is a black bay Arabian-Lusitano 5 yr old that is in LOVE with Visten and him with her. Their colors are similar and they stand side by side over the fence every chance they get. Visten's feet are still really sore! I can't really do much more than just love on him and work with him as he stands tied. 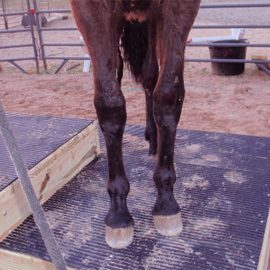 Dr Portie, one of your Vets from Sunset Canyon vet clinic is going to xray Visten's legs on Thurs. We want to havea base line for his knees. By the way the knees are HUGE. Today in preparation for the trip to the clinic, Visten and Boullet loaded and unloaded a few times in the bigger trailer. V did it perfectly. 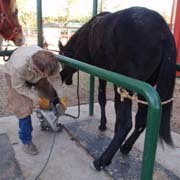 I then put him in the stocks to medicate his eyes and Allen was trimming feet on a couple of our horses. One is Hasan (same age as Boullet) that is turned out during the day with Visten and housed next to him at night. 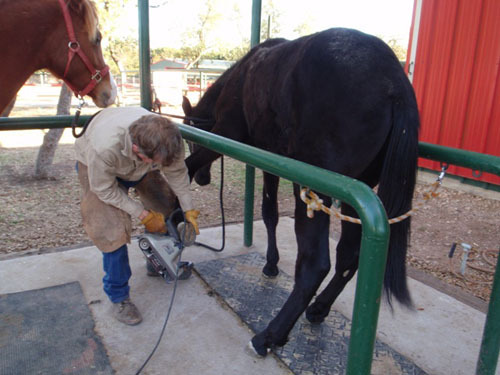 Allen often uses a belt sander on our horse's feet and Visten watched this with lots of curiosity. Allen then picked up Visten's feet and rubbed the sander around his foot (outside as he is sore) and around his ankle. No problem. In addition to being a very trusting little soul after his tough beginnings and he always just copies what the other "boys" are doing. It is a great help to have several youngsters at once. I came out to the ranch today and Visten and I had a scratch in. He is so calm now and loving. He stood very still and made lots of funny faces while I scratched him from the top of his head literally to his tail. Poor guy - he is very fluffy from being raised in the North and is not used to our fickle Texas winter. Cold one minute and hot the next. He is shedding out at a pretty good rate and I know he must be very itchy. His eyes are continuing to improve and are only a little pink now. Sue let me put his eye drops in and he tried as best he could to stand still and let me. His feet are still a little sore and walking on our rocky Texas soil is hard for him - although that also is improving. He followed Sue right up into the trailer to be fed and was calm throughout no matter what happened - the wind caught the door and swung it shut with a bang, his "sister" horse came up to nose him from behind and was chased away, Sue handled his legs, Boullet reached over the partition and tried to start a game. He just looks around and takes it all in. Getting out of the trailer is a little trickier, and though he was a little reluctant, he trusted Sue and did what she asked. It was really no big deal when Sue squeezed in there with him to pick up the rope. When I left, he was playing with Boullet. Visten was very calm today. 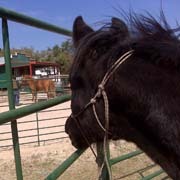 He enjoyed playing with Boullet and Hasan and also got his first lesson since arriving at Red Horse Ranch. We worked on basic ground manners when leading. 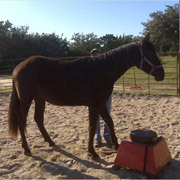 He learned how to circle on a working line and knotted halter and change directions-figure eight in hand. 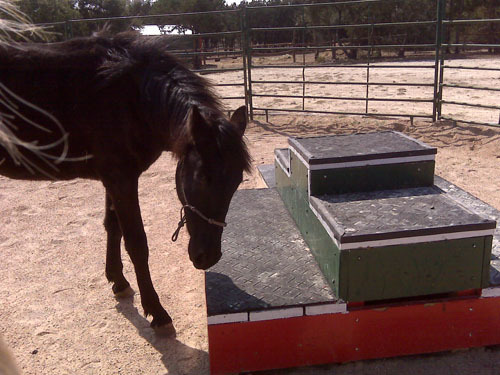 He watched while Boulled mounted the Agility Platform, was very curious and walked around him a couple of times just looking. I was able to get him to give me one front foot "Up". While Boullet was out of the barn yard, Visten saw Allen working 3 young horses at liberty in one of the round pens and started trotting after them on the outside of the ring as they circled on the inside. It was really fun to watch but it happened so quickly though that I couldn't get to the camera. This evening he followed me around doing chores, no halter just hanging out like the other youngsters. He was very interested in everything going on around him.